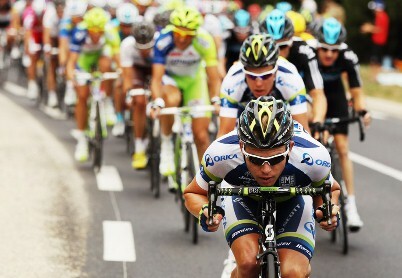 How do physicists predict the winning times of Olympians or the Tour de France? One LC student learned this summer with Dr. Eric Goff. Brian Ramsey ’15 worked with Dr. Goff to predict each stage of the Tour de France, which ran from June 30 to July 22. The 99th Tour de France was made up of one prologue and 20 stages and covered a distance of 3,497 kilometers. Using physics, they predicted the time each stage should have taken. A professor of physics and author of Gold Medal Physics: The Science of Sports, Dr. Goff is also following the Summer Olympic Games in London and providing commentary on his blog, as well as in the media. You can follow his predictions on Dr. Goff’s blog and check out this story in Outside Magazine. Dr. Goff was one of the headline speakers at the International Sports Engineering Conference July 9-13 at the University of Massachusetts Lowell Inn and Conference Center. Check out coverage in the Lowell Sun. Featuring presentations by global sports science experts, the conference took place in the United States for only the second time in its 16-year history. Other speakers included John Brenkus of ESPN’s “Sport Science,” Bruce Jahnke of K2 Sports, a designer of outdoor sports gear, and Wolfram Meyer of the Federation Internationale de Football Association. Topics focused on the ways in which high-tech materials, instrumentation, and evaluation techniques can improve performance.